The colour for this month is RED. 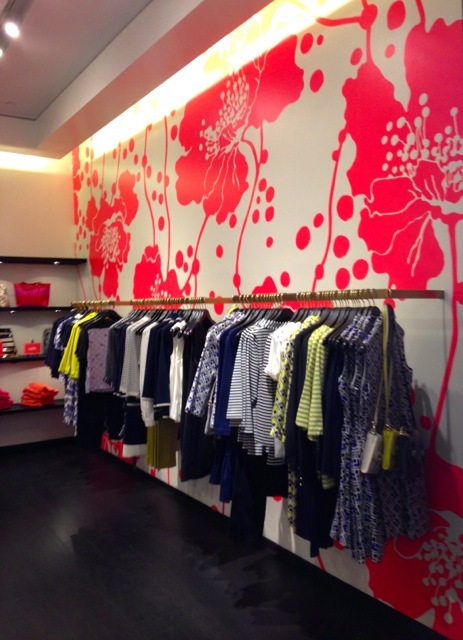 So here it is: our favourite red pieces in Singapore! 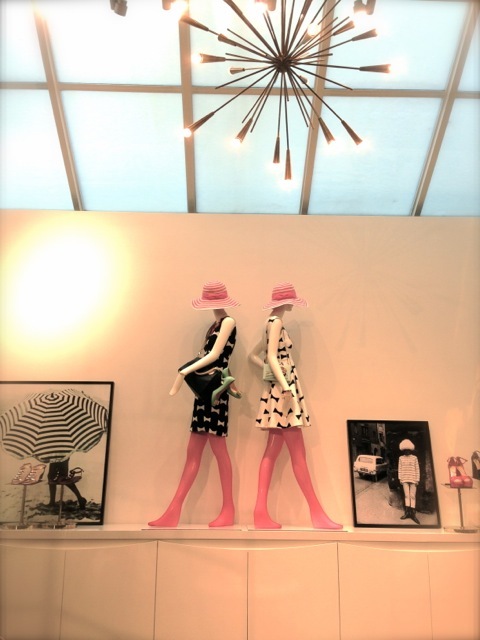 Marc Jacobs shopfront at Mandarin Gallery. We like the outfit on the left! Preppy, girly and whimsy all in one. 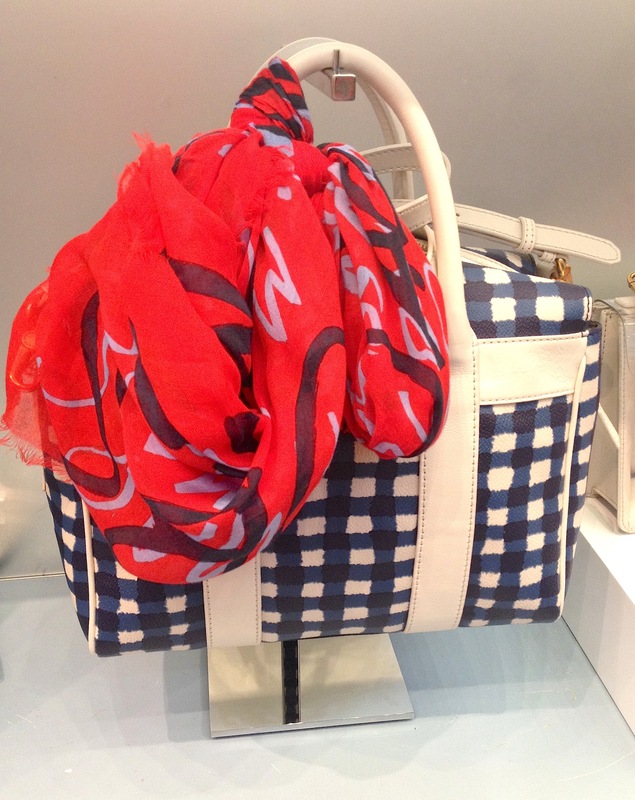 Loving this Marc Jacobs scarf – it’s part of their new collection (which means: exxy) but we absolutely love the design and oclours. Embarrassingly enough we would be happy with any of the necklaces below, but we do love the typewrite one and the green/red combo- reasonably priced too! You can find these in the Hansel store at Mandarin Gallery on Orchard road. Jelly shoes. 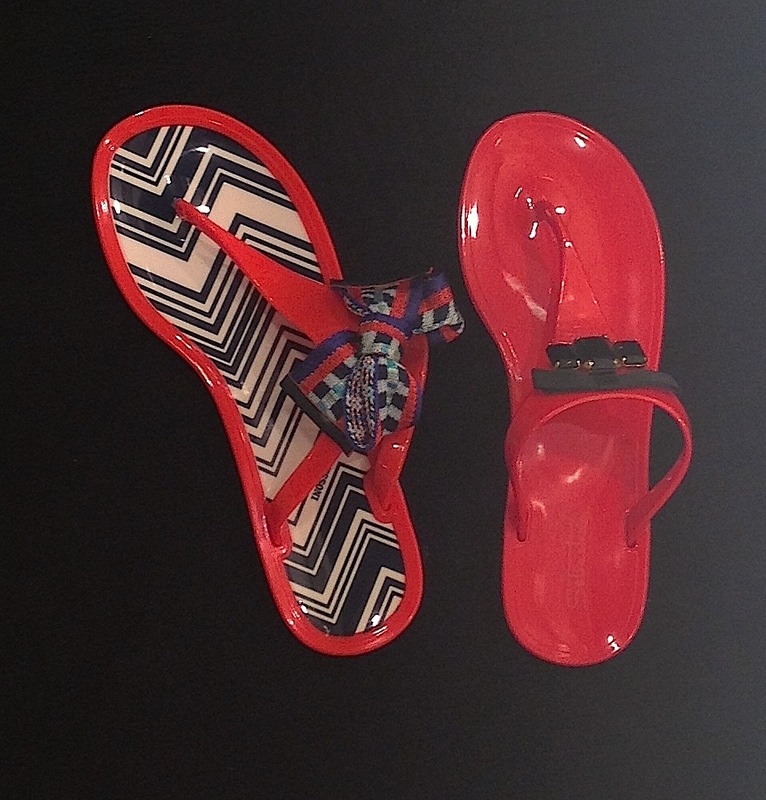 If you live in Singapore and you do not own a pair of jelly sandals, then BUY THEM. They are awesome. Breathable and won’t get ruined if it rains. 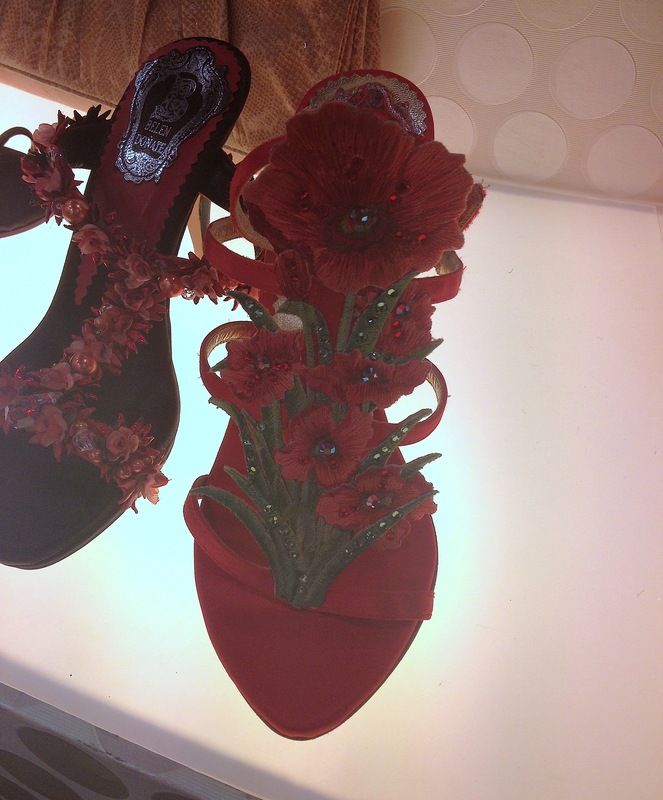 The ones below are Sebastian shoes from Italy, so they are super expensive, but hey they come in red and we love the designs. We found these in one of the shoe stores in Mandarin Gallery (sorry guys, can’t remember which one, but they stock a range of shoes from Europe). The lighting in the below pic is a little dull and dreary, but hopefully you think it just adds to the effect considering the type of shoe you are looking at below seems quite ethereal! 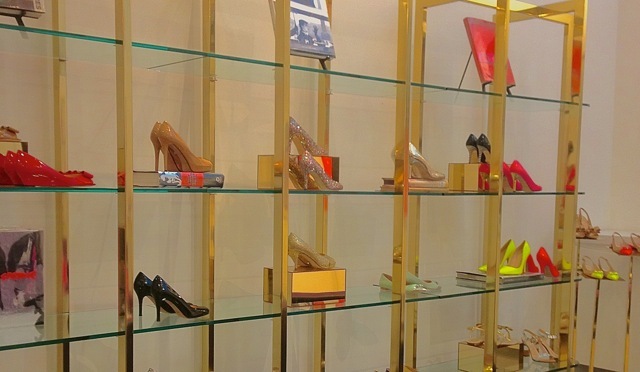 Amazing shoes at amazing(ly high prices). 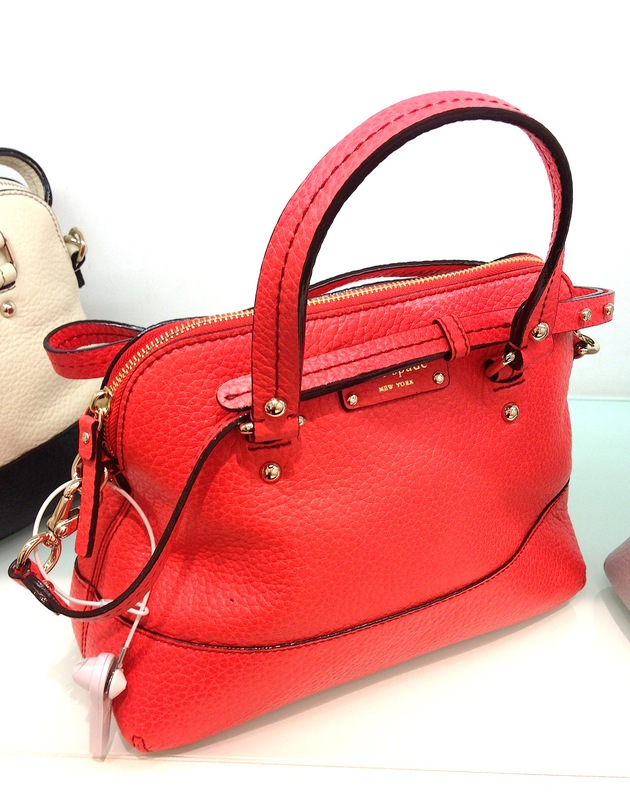 Kate Spade red handbag alert below! 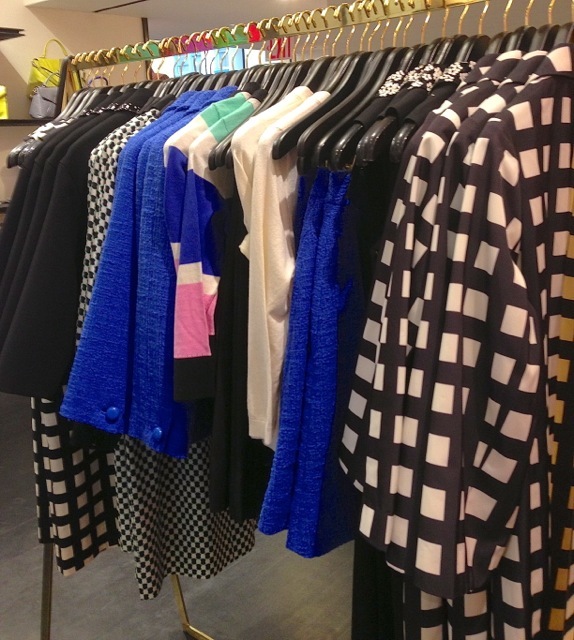 Shanghai Tang has a new collection out – and there are a few stand out red dresses included. Carmen is obsessed with this brand, and even eying up that vase in the background. Out of all the above, we must admit the bag from the Society of black sheep is our favourite! 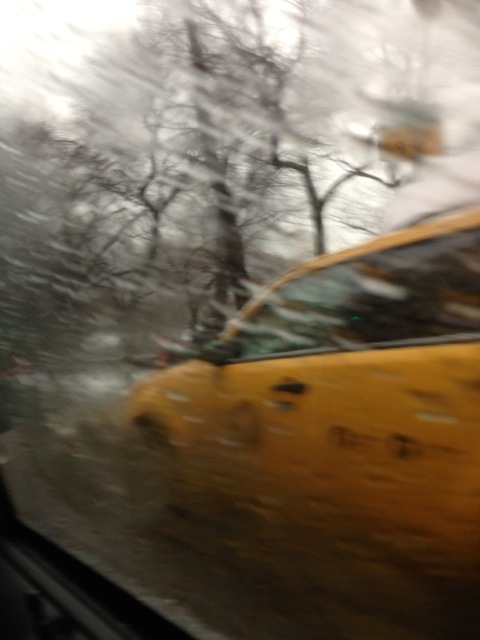 On a snowy, wet and slushy late afternoon, Natasha decided to brace herself for the snowstorm brewing in New York to check out the exhibition currently being displayed at the Metropolitan Museum of Art. This museum is amazing and everytime she has the chance to go to the Big Apple, she always makes an effort to pop by. And boy was she glad that she did! 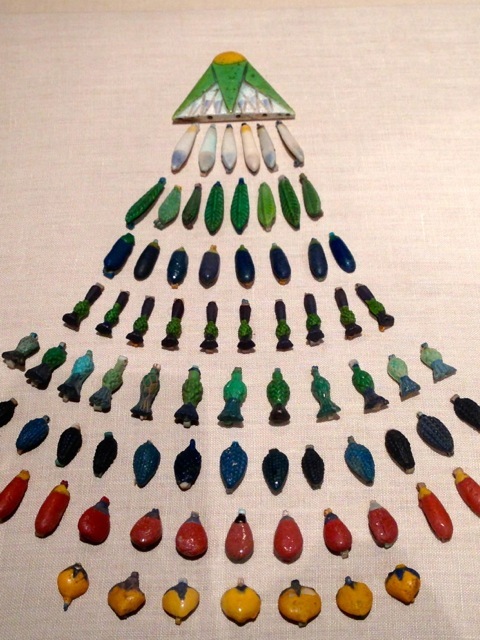 The museum happens to have special exhibition on Egypt. Now we must admit we’re not crazy about tombs and mummies, but we’d be lying if we said that Cleopatra wasn’t hot! Her clothes, jewelry, even her haircut. 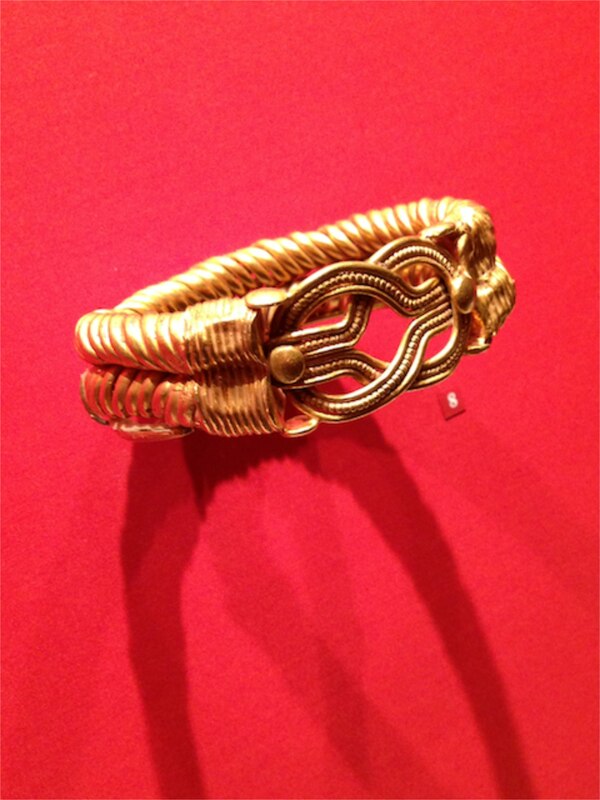 So Natasha navigated her way through the mummies and Sphinx and headed straight to the jewelry section. Some of them were just jawdroppingly exquisite and gorgeous. 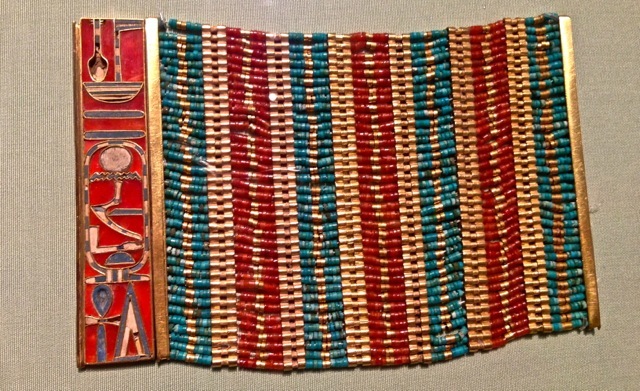 She took a few photos of some of her favorite pieces, while silently oohing and aahing at the Egyptian marvel – and we’re not talking about the pyramids! This one was Natasha’s favorite! 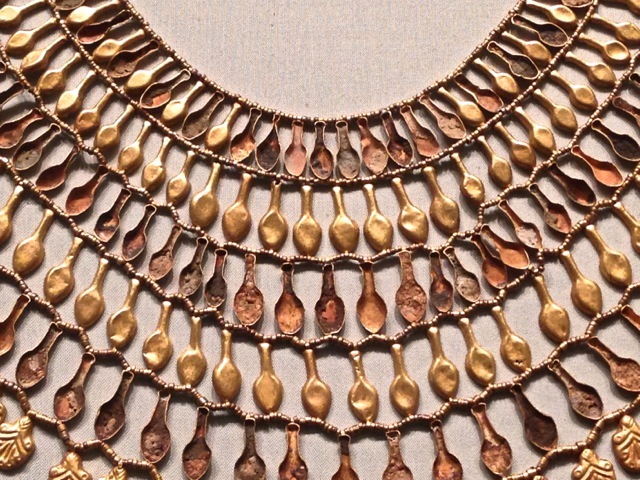 And you can see why – it’s so intricate and unique, it looks like it’s made up of little dainty spoons. Ladies, this necklace is simply divine and words simply cannot describe how much Natasha wanted to break the display glass, grab the necklace and run so fast it would put Forrest Gump to shame! 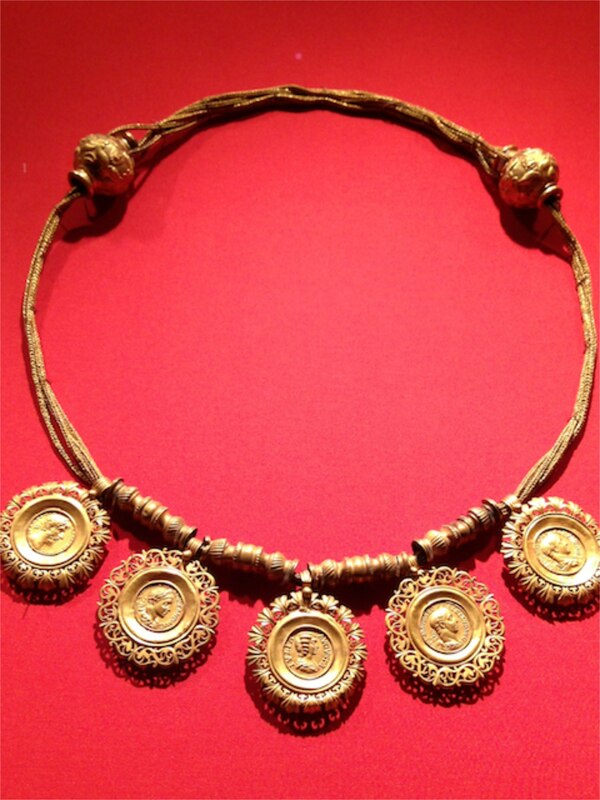 Check out the bracelet above and the necklace below. The design is so unique, vintage yet modern at the same time. 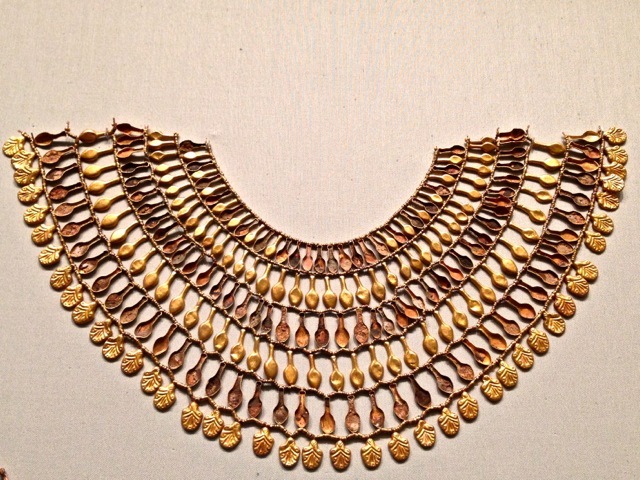 You can picture these pieces on Nicole Ritchie’s or the Olsen sisters’ wrist and neck, can you not? The necklace above such an attention grabber! How did they do this so well back in the days? Again, the colors and details combined with fantastic craftsmanship is such a winning combo! This particular piece is one of the older ones on display, but they managed to find the different pieces and put them together. 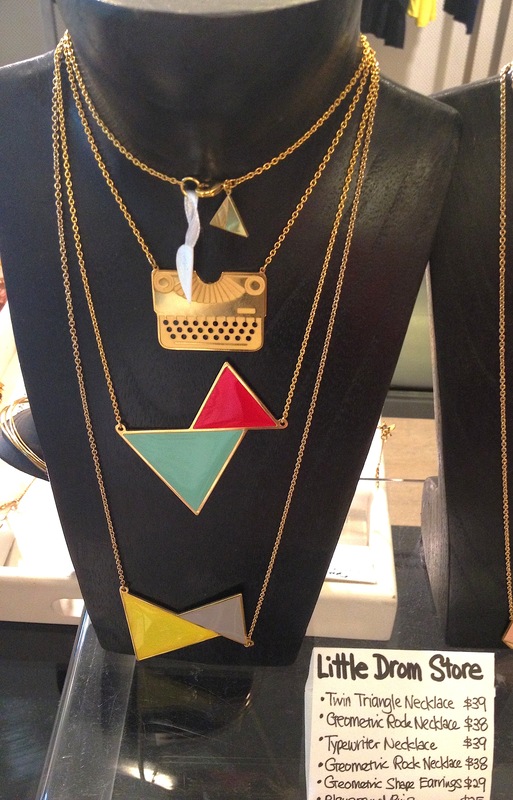 The different shapes, colors and sizes make this necklace droooooooolworthy. 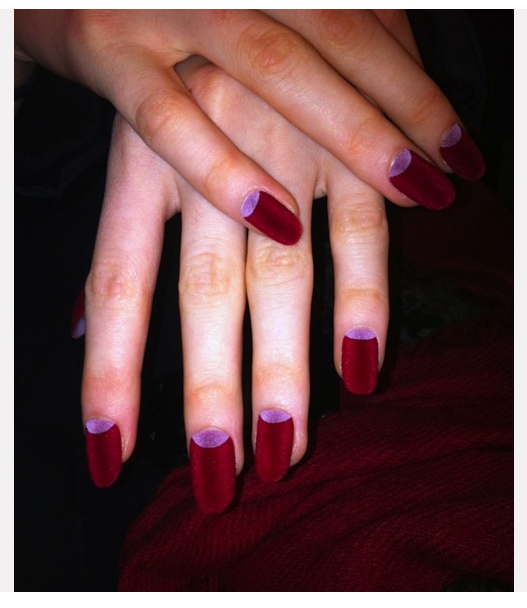 The simplicity of the design above gets Natasha’s vote. 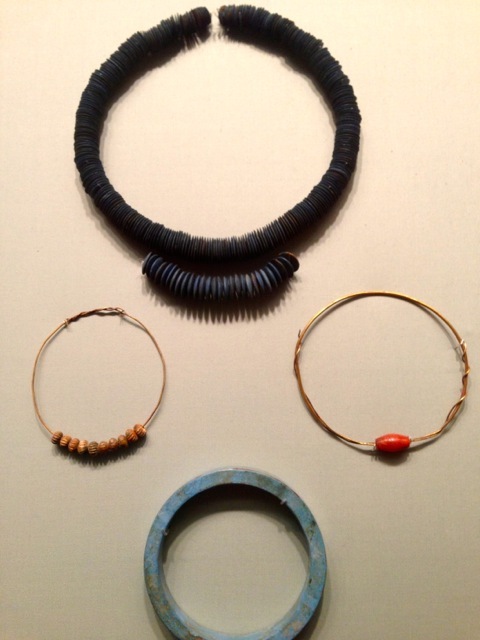 From the sea urchin-inspired necklace, to the simple bracelet combined with the blue bangle, makes a stylish combo. Last, but definitely not least, Natasha’s second favorite piece of all the pieces she saw. She was just flabbergasted when she saw this bracelet, the detailing and beautiful clasp to close the bracelet…….. Just so exquisite and tasteful. 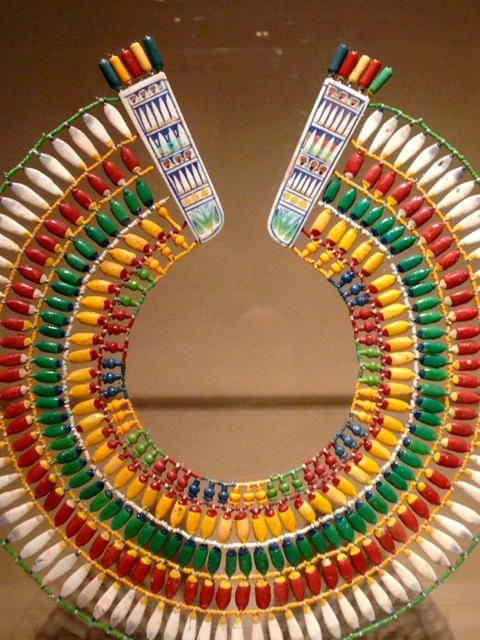 Well our dear readers, looking at the jewelry above, you can’t help but think ‘why don’t they make jewelry like this anymore’?! And that is exactly why we will always visit the Metropolitan Museum, you just simply never know what special treasures lie inside. 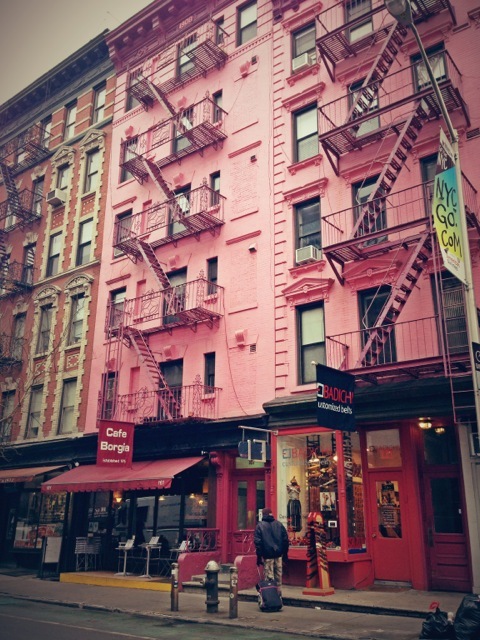 Watch out for more NYC blog posts in the days to come! This time around, it was Natasha’s turn to tag along to New York City, one of her favorite cities in the world! Despite it being winter in New York, nothing stopped her determination to check out what spring fashion in New York would look like. 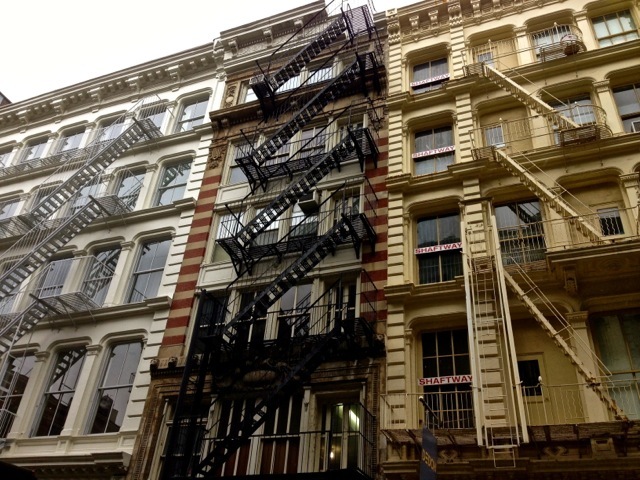 For those of you who have been to New York, you would know how awesome SoHo is! 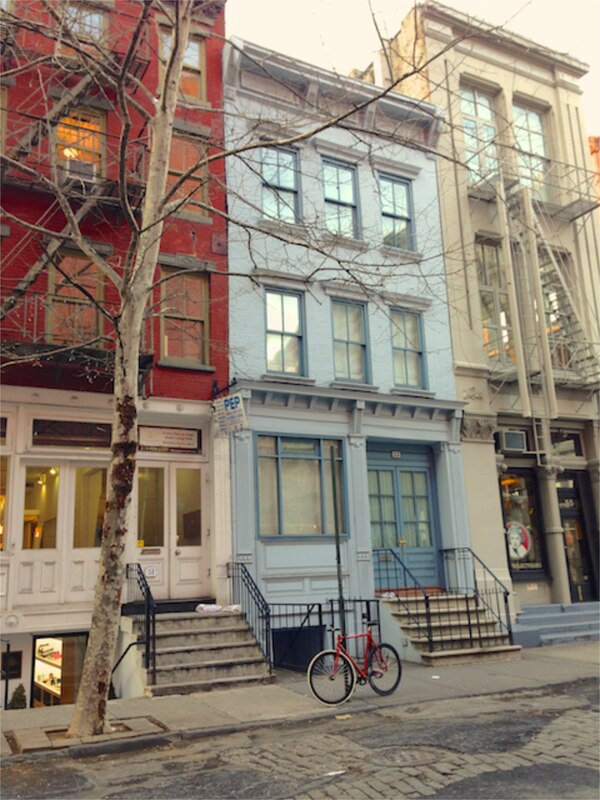 It is a great neighborhood with cute little shops (think Chapel Street in Melbourne, combined with the little alley ways like Flinders Lane). It’s packed with neighborhood bakery, cafes, trattorias, and many more hidden gems. 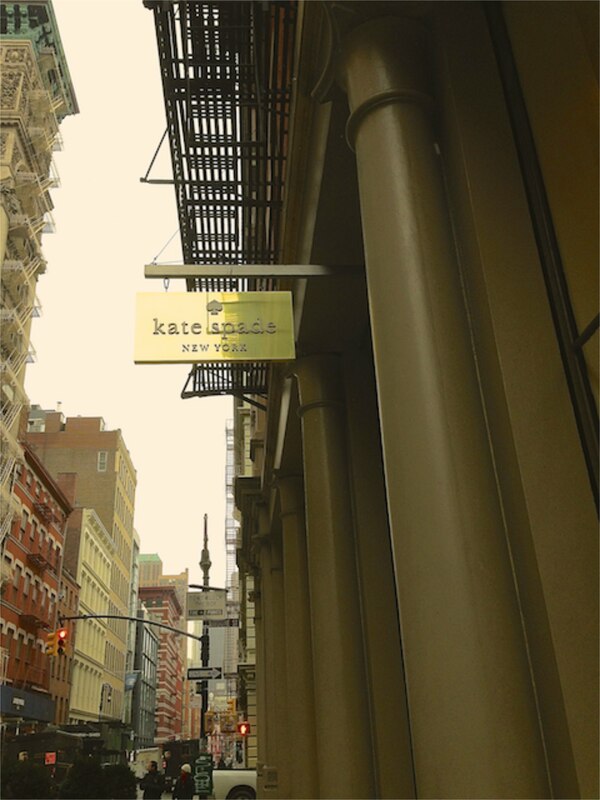 Natasha was lucky to stay in this area for one whole week – she even had the chance to spy on Katie Holmes sitting quietly in a corner of the local cafes! 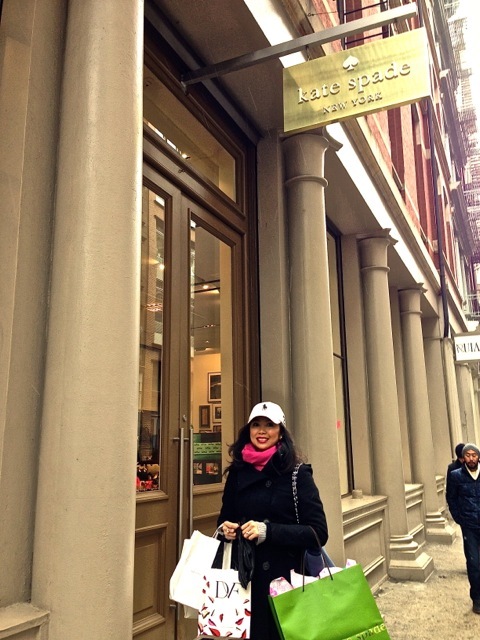 Without much consideration, she knew she had to check out the Kate Spade flagship store – rumor has it they’re going to open a three-story shop to accommodate all things Kate Spade, including her bridal and home collection! 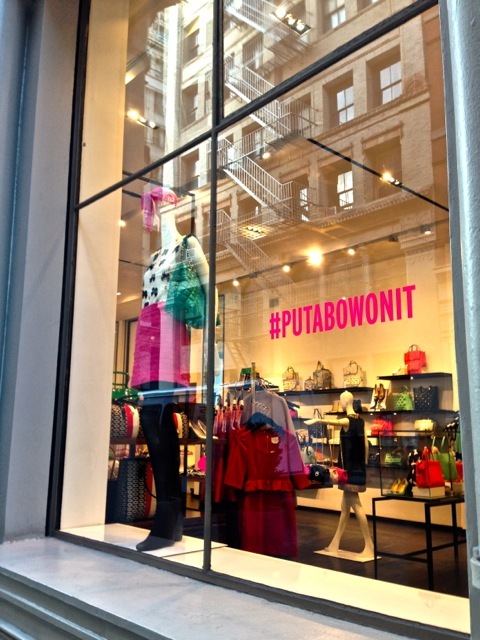 *note to self: think of an excuse to go to New York again when the shop opens. The hot pink and stripes work really well, especially for spring. Thanks to Singapore’s freezing malls and offices, we can still wear something like this in this part of the world! 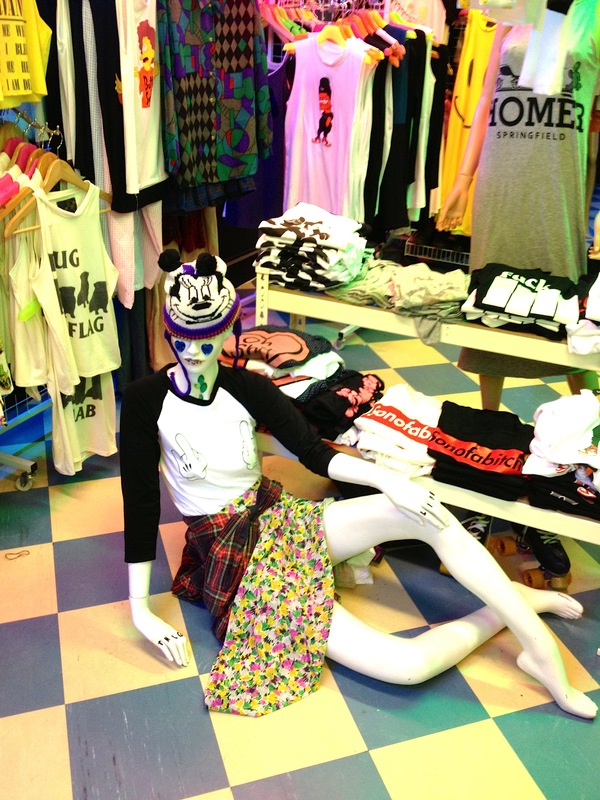 How cute are the mannequins? Imagine wearing the dresses with a pair of colorful pumps or even wedges. Love! The shoes look so enticing that Natasha just had to try on a pair herself. In the world of Carmen and Natasha, trying often means buying and this time was no exception. And the best part? The lovely sales assistant gave her a generous 10% discount, because it was the last pair in size 8.5! 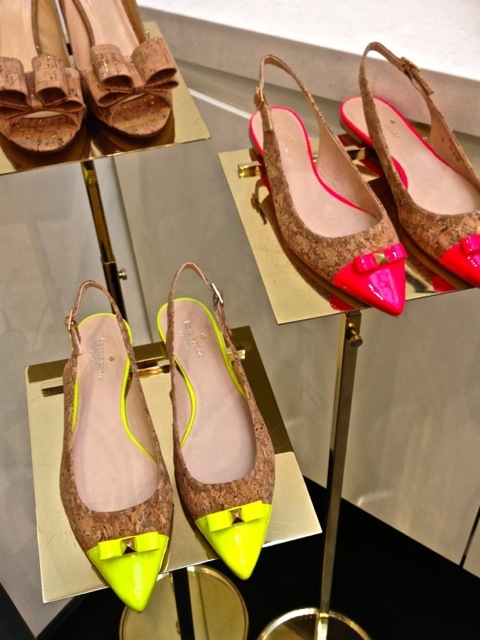 How gorgeous are these pointy slingback flats? The cork material combined with the neon patent tip really works. They would look adorable with a cute summer dress or an A-line skirt paired with a crisp white shirt and statement necklace. 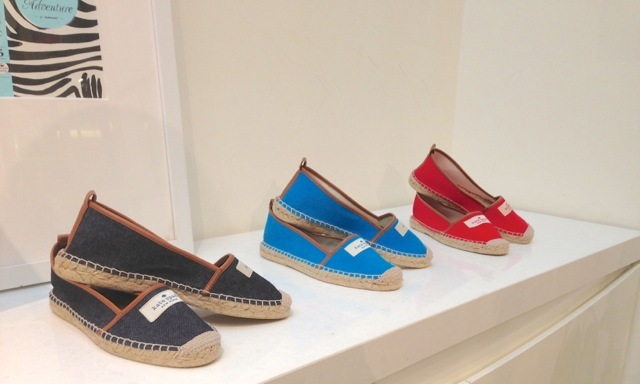 Check out these cute espadrilles! Imagine pairing it with cotton shorts and a denim shirt. The denim ones were Natasha’s favorite. 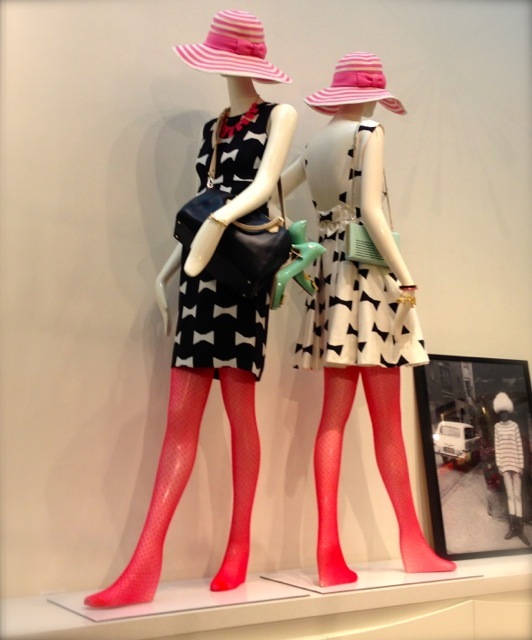 We are loving what Kate Spade has to offer for the spring collection. It’s very pop art! We want them all! 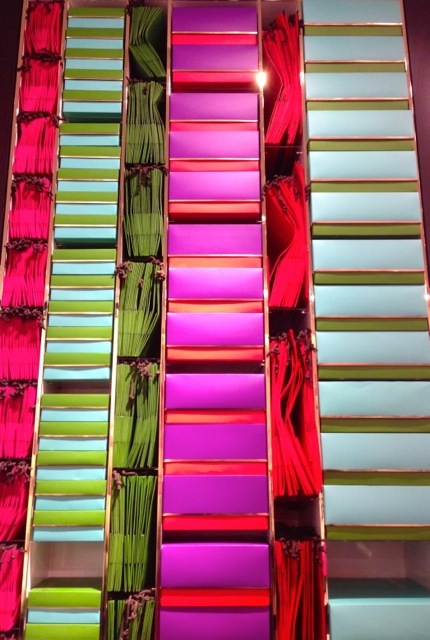 We love the way the boxes are stacked – the colors are just amazing. 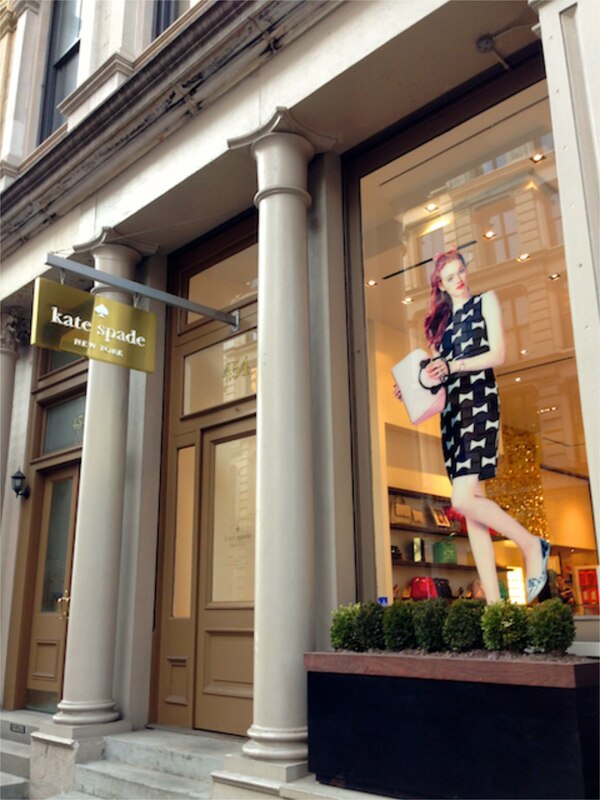 So long Kate Spade, we will definitely be back in NYC, preferably in spring when the weather is a lot more nicer. Ok we are going to be very honest about this one – this store is for SERIOUS vintage/ thrift store customers ONLY. If you can only handle buying clothes from Chanel or Prada where everything is clean and shiny, than Oakham market (O-mighty) store on Haji Lane is NOT the store for you. 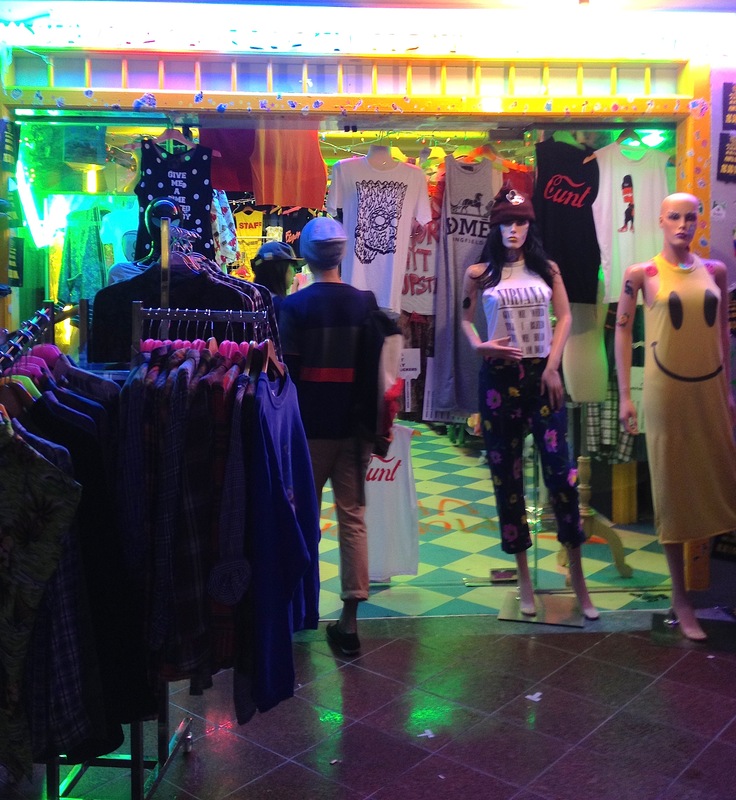 Other “interesting” aspects about the shop – prepare to enter a club with pounding music that plays the most random songs you will ever hear (it’s actually hysterical after about 5 minutes in the store) and the lady at the front counter definitely had a “punk-rocker” attitude (i.e. couldn’t care less if we existed or not!). Anyway now that we have the negative out of the way…. (don’t say we didn’t warn you)… check out the gems that CAN be found if you spend a bit of time searching through the shop! 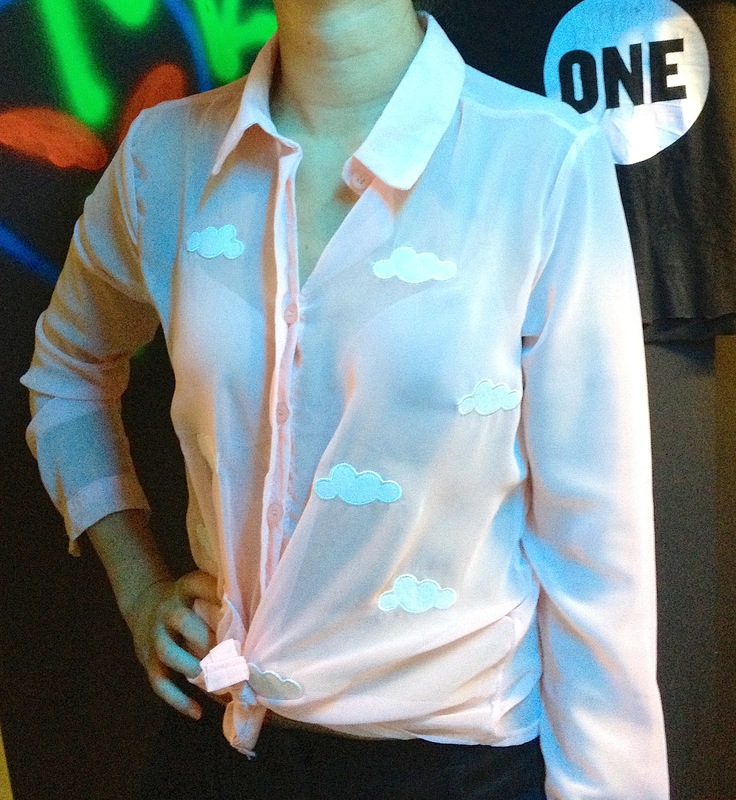 Here was the best gem we found all night – a cute pink shirt with clouds on it! We LOVED this shirt and Carmen ended up buying it. Cost of this little gem? $16 SGD. Ok this pic below is a little furry, but you got to remember we had pounding music, neon lights and can you see that glittery mardi gras-esque curtain on the left? yes it was that kind of place, and we’re going to blame their loud subwoofer for shaking our camera (ahem). Anyway the blouse was very cute with airmail postage stamps, and the skirt matched perfectly with the top (we liked the contrasting blue at the top of the skirt), however both outfits were $50SGD. The blouse was worth it, however the skirt had a bit of a weird shape when we tried it, it buckled a little at the bottom. 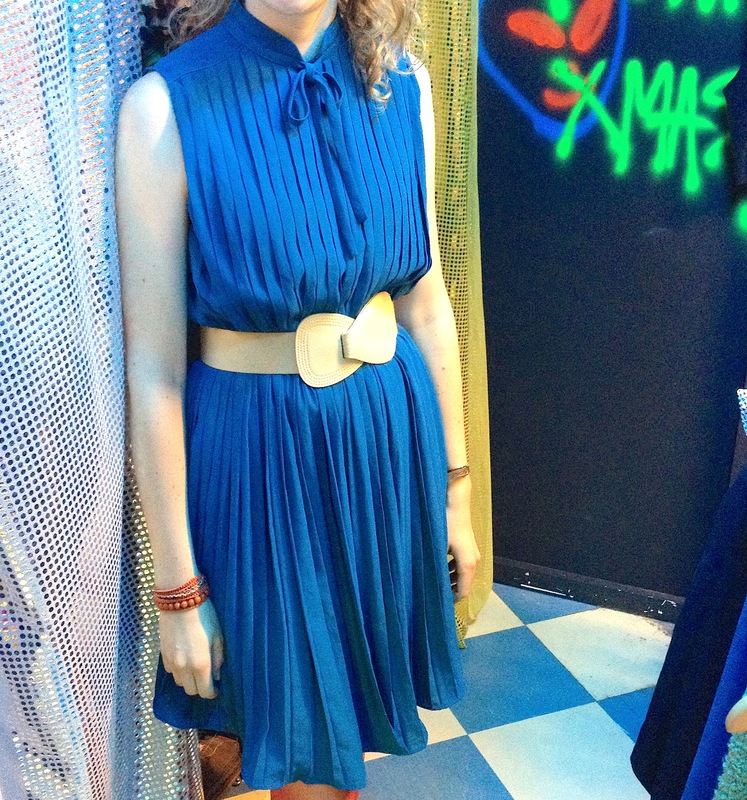 This dress below was very cute, although jury’s out on the tie collar. 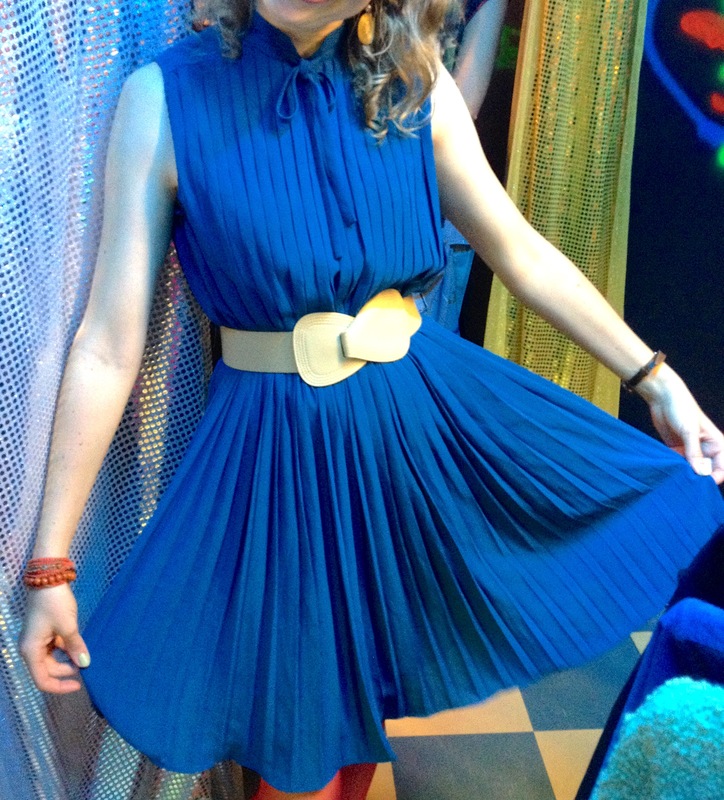 Love the pleats, andit definitely needed a belt (not included with dress). Still a pretty cool find in this shop! And here is yet another example of the “interesting” shop displays throughout the shop! They also had some pretty funny Simpsons t-shirts! In case you want to look at their (REALLY CRAZY) website… and we can honestly say hand on heart that we have never viewed such an epileptic inducing website before in our lives….then check out the shop’s website below – don’t say we didn’t warn you! Would we go back? Absolutely! It was a fun filled occasion that was definitely more interesting than browsing through Orchard road for the hundredth time. Our tip – go at night and with a bunch of girlfriends! 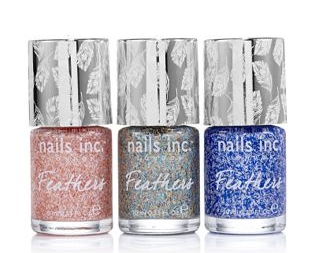 Here is the coolest nail trend moving forward, forget boring normal nail polish… check out the new polishes where it’s all about texture! 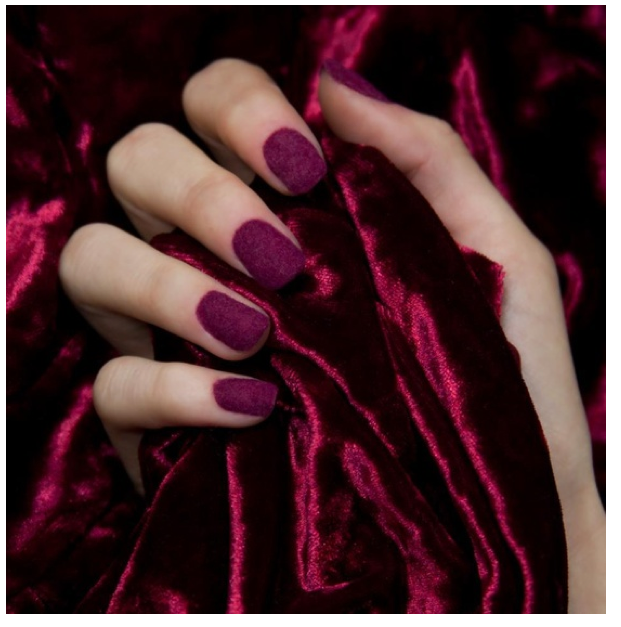 And VELVET texture was big too – Blake Lively even had velvet nails at her wedding to Ryan Reynolds! Which look would you be willing to rock?! Sometimes we are just not in the mood to go out shopping (yes we know, gasp horror, but it’s true!). It might just be too hot, we’re not in the mood to deal with the crowds, or just deal with people in general. So if that describes you right now, why not look at hitting the shops online in Singapore? We know everyone has heard of Zalora, ASOS etc, but what about some others that aren’t as well known? Well here are some of our top picks right now! Great online store, only thing is we wish the prices were in SGD (not USD). Not sure why they us USD but fear not – they are indeed based in Singapore! We love this shirt below, with the minty green it looks quite special but we think paired with white it would look pretty cool too. 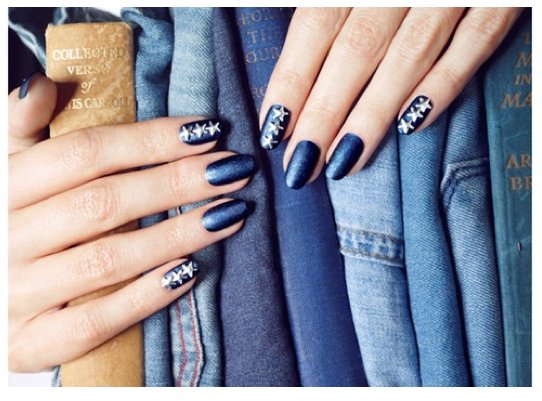 LOVE this, and reminds us a bit of the denim on denim pic we showed our readers earlier – try it with faded jeans! 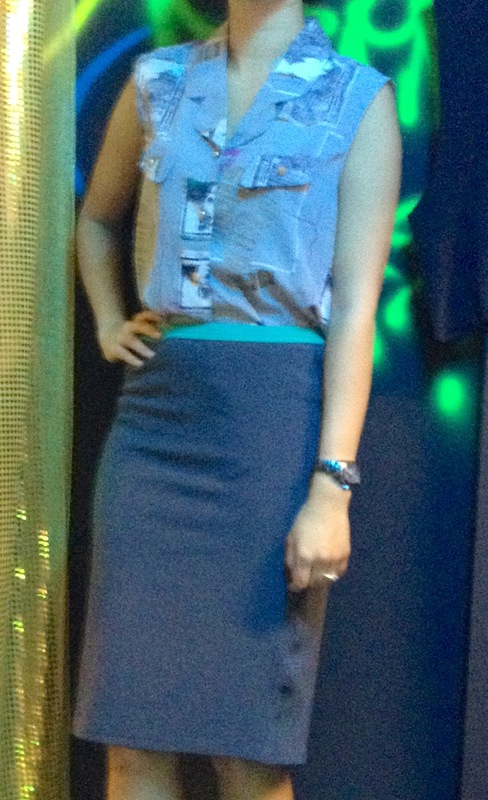 Love this top below paired with the same mint green skirt. 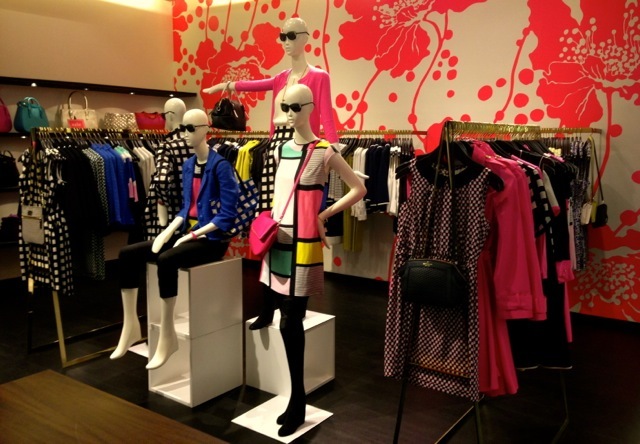 Just casual yet chic and great for Singapore! Cute floral print dress below and the belt helps to complete the look! Just throw on some nice sandals and away you go! 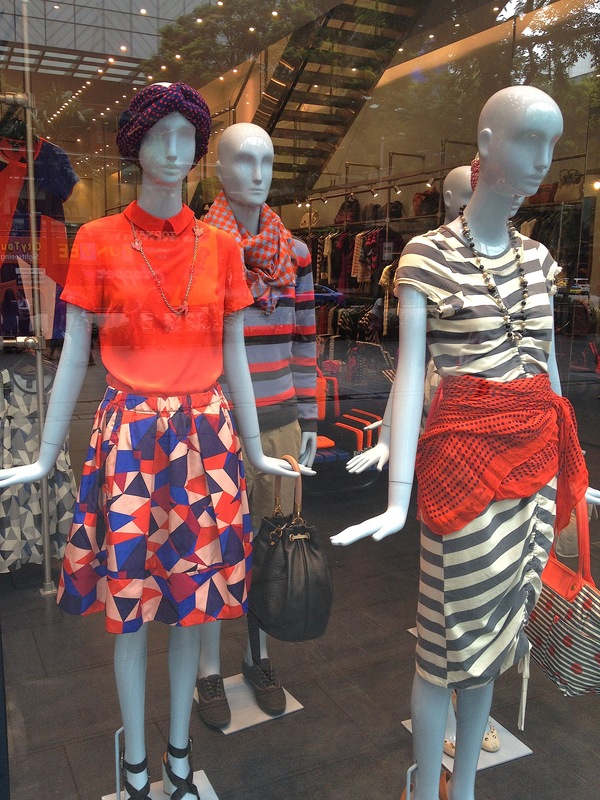 Ok ladies, stripes are in – whether you like it or not! We like this casual dress below and think it’s a great way to run to the shops whilst also looking bang on trend! Cute and simple white dress below – we think this could be accessorised with some bold chunky jewellery, or simply keep plain for a timeless elegant look! This strapless dress below is so versatile – you could easily throw a black jacket over it and it would be suitable for the office, or for a more casual look we love the white short paired over the top! LOVE THIS LOOK. We have mentioned Singaporean brand Hansel quite a bit in the past, as we loved their puffin dress and clean lines along with great quality! However check out these cute fish earrings currently available online! Now on sale for only SGD48! Arghhh we love this dress below. Simple yet it’s so soft looking and feminine! Love the little pink detail around the waist, and the fabric looks amazing. This is high on our wish list! Unfortunately they are out of stock in smaller sizes, but UK sizes 10 and 12 still available! What a cool tank top dress below, we love this too! Unfortunately this appears to now be out of stock via their online shop (let’s hope they get more in soon!). Ok this sleeveless shirt is another one high on our wish list. We know contrasting colours for the collar is so yesteryear, however we still love this look…. so whatever! Oh my gosh we could DIE! A slouchy comfortable dress that also looks amazing?? Yes please! We want this….. badly! Which outfit would you purchase? We know, we know… it’s a hard call!